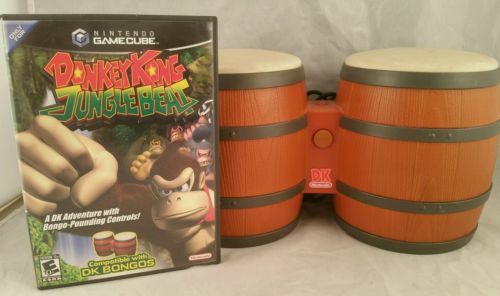 The DK bongos are a peripheral for the Nintendo Gamecube. They came packaged with Donkey Konga and DK Jungle Beat, and were made specifically for those games. The bongos themselves are made of plastic and feel quite sturdy. The DK bongos have three buttons and a microphone. The two skins on the bongos are the L and R buttons. There is also a start button on the bridge connecting the two bongos. The microphone is under the start button and is used to sense clapping. Playing the bongos is great fun, and it's quite satisfying to bang on the drum skins even when no game is being played. The DK bongos "work" with every Gamecube game, but there are only 3 buttons, so you'll really be struggling if you try playing anything with a complex control scheme. 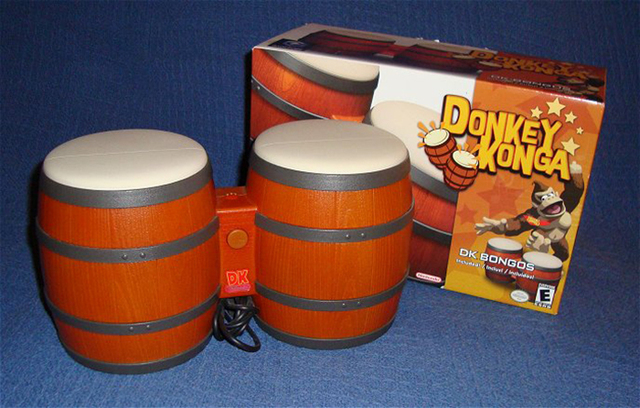 The four games that the bongos were specifically made for are DK Jungle Beat, Donkey Konga, Donkey Konga 2, and Donkey Konga 3 (which was only released in Japan). You can really challenge yourself by playing any other game and trying to succeed using the bongos, though it's not recommended for more than a few laughs. Donkey Konga is like Guitar Hero, but with bongos. The bongos work very well with the game. They are very responsive and the microphone is very accurate at sensing claps, even from across the room. It can sometimes be annoying when playing with multiple bongo sets on Donkey Konga when one of your friends has a clap and you get a miss since your bongos registered their claps, but other than that, they work very well as intended. DK Jungle Beat uses the bongos as the main controller. The controls are fairly straightforward: L goes left, R goes right, tapping both jumps, and the mic makes DK clap (and collect bananas). Despite not having a joystick, the DK bongos actually work quite well in maneuvering Kong around all of the fruit themed worlds. 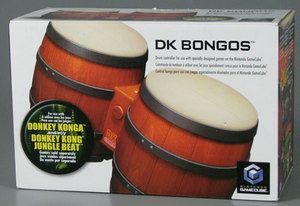 While the DK Bongos were released in December of 2003, they are still available in the wild to this day. Used game stores often sell them for about 10 dollars, sometimes eBay sellers have them them for 5 dollars. If you come across a pair of these beauties, I highly recommend you pick them up. Even if you don't use them, they are a cool collector's item. They also look nice enough to display with all of your DK games!